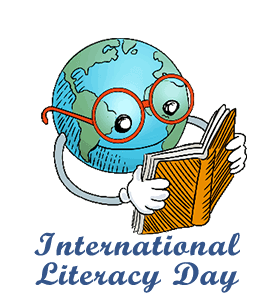 ﻿International Literacy Day: Calendar, History, Tweets, Facts, Quotes & Activities. International Literacy Day serves to recognize the importance of literacy and acknowledge the need to create a globally literate community. Literacy refers to a person's ability to read or write, an ability that connects and empowers people, allowing them to communicate and interact with the world, and one that the United Nations considers to be a basic human right. Today, approximately 16% of the world's population, two-thirds of which is female, is unable to read or write at a basic level in their native languages. Illiteracy in nearly all parts of the world has been linked to socio-economic issues like poverty and demographic factors such as gender. In an effort to combat illiteracy, the United Nations Educational, Scientific and Cultural Organization (UNESCO) created International Literacy Day in 2000. During the 2015 campaign, themed Literacy and Sustainable Societies, UNESCO stressed the importance of literacy as the most powerful accelerator of sustainable development and pledged that by 2030, the organization will ensure that all youth and a substantial proportion of adults, both men and women, achieve literacy and numeracy . This international holiday is observed annually on September 8th. The theme for International Literacy Day 2017 is Literacy in a digital world. UNESCO reports suggest that due to increased access to schooling for this generation, the global youth literacy rate has increased to 91% in 2015, up 8% from 1990. According to the National Assessment of Adult Literacy, 50% of American Adults are unable to read a book at the eighth grade level and 23% of American Adults are functionally illiterate. In the United States, 75% of state prison inmates and 59% of federal prison inmates did not complete high school. We must invest more, and I appeal to all Members States and all our partners to redouble our efforts – political and financial – to ensure that literacy is fully recognized as one of the most powerful accelerators of sustainable development. The future starts with the alphabet. - UNESCO Director General at the 2015 International Literacy Day celebration. Volunteer at your local retirement home, nursing home, or hospital as a reader. Volunteering as a reader will allow you to share the joy of reading with the elderly or ill patients. Watch inspirational movies about education and literacy. Our picks: Stand and Deliver (1988); Good Will Hunting (1997); Precious (2009); Dead Poets Society (1989) and Dangerous Minds (1995). Donate books to prisons. The Prison Book Program details specific information about how the donations can be made. Many libraries and even bookstores offer free readings. Check their website to find out about upcoming readings.